Beauty doesn’t have to come at a a cost to our environment. At Servis & Taylor we strive to be ethically aware and responsible for our environment and the working conditions among mine workers. 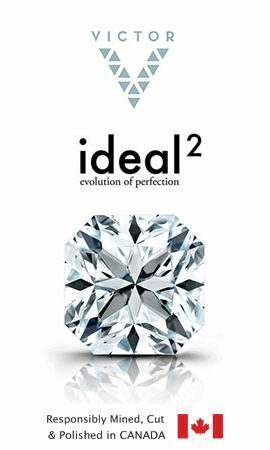 For those wishing to go 100% “Green” and 100% Conflict Free we are now offering Ideal² (Ideal Squared™) and the round Victor Diamonds™, along with Harmony™ Metals Gold, Platinum and Palladium. Harmony™ metals require no new mining and uses only recycled gold and platinum. Victor Diamonds™: The only diamonds certified by the Government of Ontario, as mined, cut and polished in Canada. Ideal² and Victor Diamonds™ are cut on site by the HRA Group, a Canadian company, not foreign entities, giving work and support to the local indigenous people. It is also unique that these diamonds are only cut and polished to the highest cutting standards in the world, paying extraordinary attention to the perfect alignment of the facets and the angles to maximize the brilliance, featuring a “phenomenon” known as Hearts and Arrows, visible under a special scope.